An increasing interest has been observed in recent years on how cooperatives can, amongst other things, be a concrete tool in the hands of young people for improving their employment conditions and access to entrepreneurship. 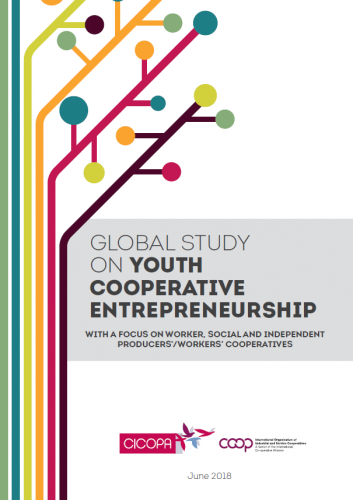 This study, which is part of the CICOPA campaign on youth cooperative entrepreneurship, “We own it! The future of work is ours”, is intended to introduce some considerations into the debate regarding the main points of interests and challenges for establishing worker, social and independent producers’/workers’ cooperatives amongst young people, in a worldwide context marked by new technologies, shifting sectoral trends and a changing world of work. Its ambition is to be a source of inspiration for further debates and research, a tool at the disposal of the cooperative movement to promote a better understanding among policy makers of the potential of cooperatives for young people. It is based on desk research and on the results of an online survey involving more than 60 youth cooperatives organized as worker, social and independent producers’/workers’ cooperatives in the five continents. 1.2. A Changing World Of Work: Especially For Young People?